Ballarat is a city located on the Yarrowee River and lower western plains of the Great Dividing Range in the state of Victoria, Australia, approximately 105 kilometres west-north-west of the state capital, Melbourne. It is the third most populous urban area in the state, with a population of 85,935. It is the state's most populated inland settlement, and fifth most populated inland settlement in Australia. People from Ballarat are referred to as Ballaratians or Ballafornians. The City of Ballarat local government area encompasses both the Greater Ballarat urban area and outlying towns. Lake Wendouree is an artificially-created and maintained shallow urban lake located adjacent to the suburb of the same name in the city of Ballarat, Victoria, Australia. The name Wendouree comes from a local aboriginal word 'wendaaree' which means 'go away': a story is told that when settler William Cross Yuille asked a local indigenous woman what the name of the swamp was, that was her reply. 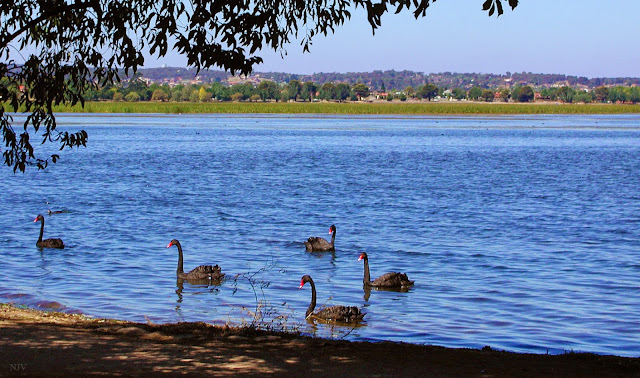 The lake is home to many black swans (Cygnus atratus), ducks and coots.